Eclipse will throw the below error when it runs out of memory. It normally occurs on big projects when performing memory-intensive operations, such as building workspace. 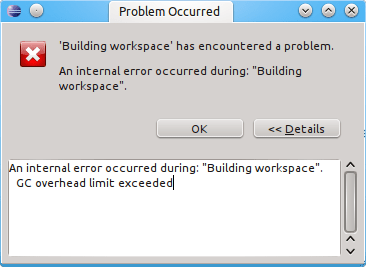 An internal error occurred during: "Building workspace". Memory is allocated via Eclipse' configuration file which is executed during Eclipse' startup. It is located in its installation directory and named eclipse.ini. The default values are good enough for small projects, but not suffice for the bigger ones. There's no one-size-fits-all solution for this issue as it depends on how much memory you need versus how much memory you have. You can start by probably doubling the amounts as in the below example and then go from there. The changes will take effect after Eclipse is restarted.